Wade stayed out of the family crime business. 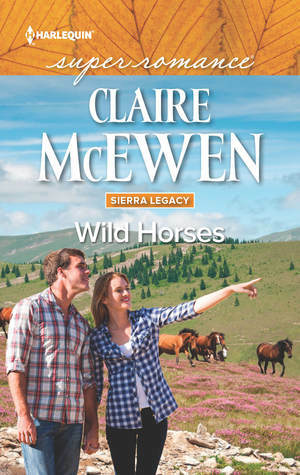 Now that he’s out of the army and his father and brothers have made a new life in Mexico, he’s back in his hometown, ready to turn Marker Ranch into a legitimate ranch. · How to site a well so you don’t swipe your neighbor’s water. · How to make amends with that neighbor when she’s furious. · How to form coherent sentences when that neighbor is someone you’ve loved since you were kids. · How to compromise when you’re terrified of failing. · How to hide the PTSD that’s tearing you apart inside. · How to ask her for her help. · How to act strong, when you feel so weak. · How to be strong, when she needs help from you. Wade has a lot to learn, and his journey to knowledge is a bumpy, bittersweet ride. I hope you’ll read his story. It’s been an emotional one to write and I’ve loved every moment. And thank you for joining me here today! Claire McEwen lives by the ocean in Northern California with her family and a scruffy, mischievous terrier. When not dreaming up new stories, she can be found digging in her garden with a lot of enthusiasm but, unfortunately, no green thumb. I really like both book covers! These books look like such fun, exciting, passionate, interesting, and intriguing reads! Looking forward to checking them out! 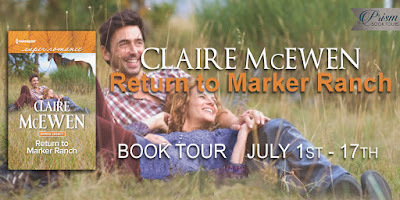 Thank you very much for hosting Return to Marker Ranch on your gorgeous blog! I love all the images... so creative. And thanks to everyone for stopping by and sharing your thoughts. I hope you enjoy the book. Sounds fantastic. Definite must read. Fantastic guest post! Thank you for the share. I like the cover with the horse in the background. I think that I will like this story and the main characters.